infinity on the scale of the megger (fig. 7-25) is similar to a horizontal figure eight. During a test, a reading at or near infinity means either that the insulation is in excellent shape or the test leads are not making contact with the component being tested. If the test leads are connected to each other while the hand crank is turned, the pointer will deflect to zero, indicating no resistance between the test leads. A zero deflection in the above-mentioned test (fig. 7-26) can mean that the conductor under test is touching the sheath or conduit surrounding it. This deflection could also be an indication that the insulation is worn or broken somewhere close to the test point. Any reading near the low end of the scale may mean faulty or wet insulation. The megger serves well as an insulation tester because of the high-test voltage it produces. The low voltage of an ohmmeter may not produce enough leakage current through poor insulation to cause the meter to indicate a problem even when one exists. But the relatively high voltage of the megger will likely cause enough leakage current to reveal an insulation problem by a lower than normal resistance indication on the meter scale. How low is the resistance of bad insulation? How high must the insulation resistance reading be before you can be sure the insulation is good? Here are some general observations about how you can interpret periodic insulation resistance tests, and what you should do with the results. 1. Fair to high values and well main- tained. 2. Fair to high values, but show- ing a constant tendency towards lower values. 3. Low but well maintained. 4. So low as to be unsafe. 5. Fair or high Make tests at frequent values, previously intervals until the cause of well maintained low values is located and but showing sud- remedied or until the den lowering. values become steady at a level that is lower but safe for operation or until values become so low that it is unsafe to keep the equipment in operation. Locate and remedy the cause and check the downward trend. Condition is probably all right, but the cause of the low values should be checked. Clean, dryout, or otherwise raise the values before placing equipment in service (test wet equip- ment while drying it out). Several test methods are commonly used. We will discuss the short-time or spot-reading tests. In this method, you simply connect the megger across the insulation to be tested and operate it for a short, specific time period (60 seconds usually is recommended). 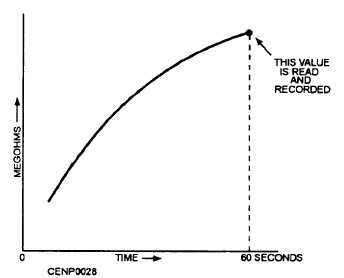 As shown in figure 7-28, you have picked a point (to take the reading) on a curve of increasing resistance values; quite often the value will be less for 30 seconds, more for 60 seconds. Bear in mind also that temperature and humidity, as well as condition of the insulation, affect your reading. Figure 7-28. - Typical curve of insulation resistance (in megohms) with time.